Starting out with college radio in the US, my broadcasting career took off after my arrival in Berlin in 1990. Since then I have been working continuously in television and radio. 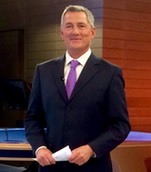 In television I’ve performed multiple on-camera roles over the years, from live reporting and news anchoring to magazine presenting and talk shows. Most of my career has been spent with Deutsche Welle, Germany’s international broadcasting service. I am currently a senior anchor with DW News. Additional TV credits include hundreds of live newscasts as an anchor at CNN International. My radio experience stretches back to my North Carolina college days in the 1980s. Since then I’ve hosted programs at a variety of public and commercial stations in both the US and Germany. In the 1990s I reported extensively from Berlin for Public Radio International’s business program Marketplace.